I was so excited and honored when my dear friend Debbie, whom I've known since our RMS days and who is also a big reason why I started my blog, asked if I would like to be part of her home tour edition. I immediately said yes and then worked like crazy getting this post together! We bought our home in January 2003. When the realtor showed us this house we knew this was the one. The couple we purchased it from was a young Chinese couple with no children. They were moving to Pennsylvania to take care of the his parents.I guess a blue eyed baby boy is good luck in the Chinese culture and the couple was trying to have a baby for sometime. The women told our realtor she felt my son was going to bring them good luck. We found out a few months later the women was pregnant. That's our little story behind the purchase of our home! At the time my son was 8 months old and when we went inside to look around the young women went crazy over him and asked if she could hold him. She was very sweet so I let her. The next day our relator called us to let us know there was multiply offers on the house, we thought great now the bidding war starts! Well to our surprise that didn't happen, the couple excepted our offer and within a few weeks we closed on the house. The realtor then told us we have our son to thank!?! Going down to the backyard and pool. We did all the landscaping ourselves accept for the stonework. We put the pool in the Fall of 2007 and it was the best thing we ever did. My kids all taught themselves how to swim. We spend a lot of time out here in the summer months! Last year my husband and I added the picture molding in the hall and dining room. We are big DIY'ers. When you come through the front door to the left is our living room and to the right is a small sitting room(where you will usually find me blogging). I love to mix different pieces in a room. All the pieces that you see painted throughout the house have been painted by me. I walk around with a paint brush in my hand looking for the next victim(LOL)! In our Dining Room along with painting we added the crown molding and picture molding. One of the first things we did in our kitchen when we moved in was add the granite counters and tile back splash. We also changed all the white appliances to stainless steal. Last year the hubby and I gave our plain builder basic kitchen island a makeover. We added bead board and decorative molding and painted and distressed it black. LOVE this change! Our kitchen opens up to our family room which I love since this is where we spend most of our time. This room was carpeted and a few years ago we added the hardwood. In the bedrooms all we did was paint and the hubby added crown molding to them. This is my oldest daughters bedroom and bath. We painted and added the bead board to her bathroom last year. Every bedroom having there own full bath was a BIG plus when we looked at this house. I added the striped accent wall to my sons room. Thank you Debbie for letting me be part of your home tour edition, and thank you all for coming along on the tour!! Thank you Martina for having us over. I really enjoyed the tour and the story! So much to love! Truly beautiful home! I follow Martina as well. It was a joy to see her house tour! I am also a follower of Martina's. Love the house, love the pool and the views, love Martina's blog. Thanks for sharing. I LOVE seeing Martina's home in all its glory! She is so talented and has such great vision! I especially love all of her painted pieces, too! Fabulous choice to share her home tour! I just love Martina's home. It's so nice to see it all at one time. Thanks for sharing and good luck tomorrow with the transition. wow Martina. I love every room and every detail.. Yes I follow Martina- in fact you could almost say I Stalk her every decorating move, lol..
That is surely a Dream Home~! I do have a couple questions- so may I email you? Martina's house is so pretty! I love the pool area, all her painted "victims," the dining room, her son's striped bedroom... all of it! And, she's a total sweetheart, too. Love the story of how they got their house! What a beautiful home inside and out. Cute story about her son. You have a beautiful home, Martina! It is evident from these pictures the care and love you have put into it. Love your yard. I am missing our yard at the old house about now. Thinking about everything coming into bloom. I will not miss the maintenance though! Thank you for sharing Martina's home with us, Debbie! Martina! I absolutely love your home! You have inspired me! Your living room, kitchen, dining and sitting room are very soothing. I love the way you added little dabs of color here and there! Your style is amazing! I'm heading on over to your place right after I leave this comment. Debbie, you better not disappear into thin air when you transition over to Wordpress! I just discovered your blog and love it! Thanks for hosting this gorgeous tour. Martina's home is really beautiful! She's done a lot to make it gorgeous! Thanks for sharing her home tour with us. Thanks for sharing the home tour. Marina's home is very pretty she pays attention to detail. I am a follower of Martina's also. It is fun to see the individual items in her home that she has worked on to be "in context" in the pictures of her beautiful home. Thank you Debbie and Martina for the home tour...it was a joy. What a beautiful home, and I love the story of how they purchased it! These home tours are such a treat. Thanks for sharing. Best of luck on your changeover! Martina has a beautiful home!! You know you can switch over and get your Wordpress arranged and ready without taking down this one Debbie? Or at least that is what The Hubster keeps telling me. That way you won't just upend disappear. It is all very confusing to me though. Good luck! I read Martina's blog every day. 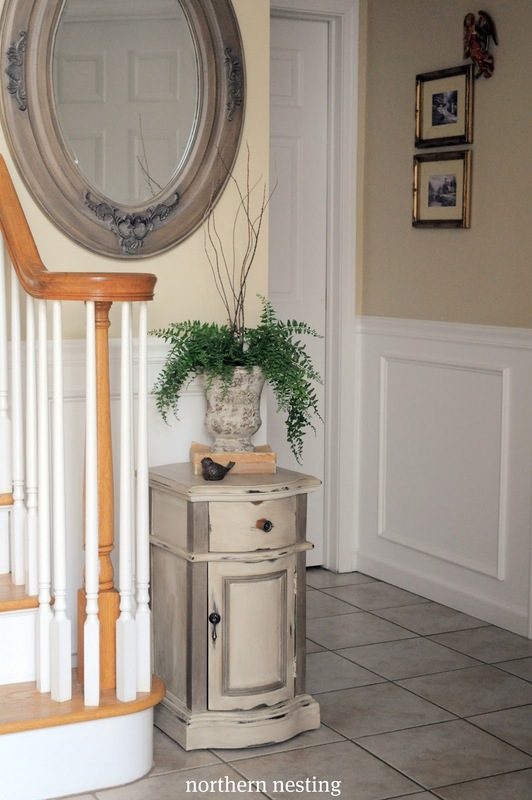 How fun it was to see her home tour on your blog! I got a chance to see some rooms that I haven't seen before. I loved the story about getting their house too. Her home is very pretty and looks like the perfect home for a growing family! I love the pool too. I didn't even know she had one. Lucky kids!! That is one beautiful home! and the lady who lives in it is so beautiful too! inside and out!!! Love the home tour! Such a pretty house. I noticed the cloches - I need to get more of them. Good luck on your switch to WP! Love Martina's home tour. I am a follower of her blog. Thanks for sharing! This is such a beautiful home. It made me miss my old home and pool. Sigh. Good luck with the move, Debbie. I don't want to lose you. What a lovely home, with a wonderful purchase story to go along with it. Thank you so much for featuring her lovely home. What a gorgeous home! I enjoyed seeing it so much! now I'll have to check out her blog! Thanks for the peek Martina! It's a stunning home. I love all the mouldings and detail you two have added. The black island really grounds the kithen and adds loads of interest. Gorgeous!! Martina's home is so beautiful, warm and welcoming...just like Martina herself! :-) So glad you featured it and her! Martina's house is lovely, isn't it. Wow, that was a gorgeous house, imagine a full bath attached to every bedroom, those are lucky kids!! Good luck Debbie, it will be fine, everyone has done it without a glitch! WOW you guy's just made my day with all these sweet comments! Thank you thank you thank you! Martina has a beautiful home! It seems filled with so much light. The views look amazing too! I'm so glad to see the full tour of Martina's home. It's so pretty. Just so, so pretty. Martina, your home is so lovely and I could just move right in. Love everything especially the colors. Great job decorating. Martina's home is so pretty and it has so much of her in the decorating. Love the story about getting the house too. Debbie thanks for hosting Martina's home. I will be checking in tomorrow. Another fabulous house tour Debbie! I love the blue striped walls in the boys bedroom! Good luck with your Wordpress move tomorrow! What a gorgeous home, and I love the story behind it. What a lovely tour! I particularly enjoyed the outdoor landscaping and all the hand painted furniture! Have a great weekend! Debbie, Thanks for featuring Martina's beautiful. I am a follower of Martina and have seen some rooms in her beautiful home. It was great to see the entire home in one tour. Hi Debbie, great home feature this week. Martina's home is beautiful inside and out...I love her pool! Have I mentioned that I really, really love these home tours? You have highlighted so many different styles. I just love it and get great ideas. This home is one of my favorites, and that's saying something since I have liked them all so far. Martina has a beautiful home. The pool is wonderful as is the view. Martina...your home is movie-star beautiful. The pool and area is just magnificent. I love every single thing about it. Debbie...you are so sweet to showcase her beautiful home. Now, please excuse me...I am on my way to The Dollar Tree to see if those foam bunnies are there so I can have something cute for MY house. I can do this project...can't I? such a beautiful home, the pool and grounds are amazing. Wow what a gorgeous home....love every room and the yard and pool! Thanks for sharing the tour! What a gorgeous home. I sure appreciate getting to see these home tours. This house is fantastic and so is the outside and the pool. Thanks for sharing. I love her house thanks to both of you for sharing it. This is a great idea for a post. Martina has a lovely home! Thanks for sharing it with us all.